Congratulations! 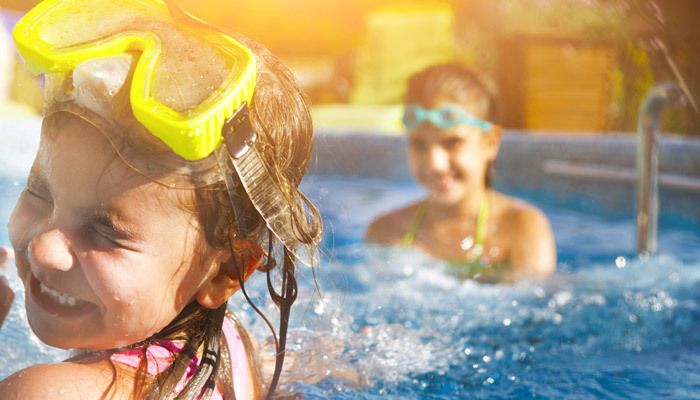 You’ve decided to make one of the most positive steps toward giving your family a healthy and attractive outdoor oasis: you’re building an in-ground swimming pool! 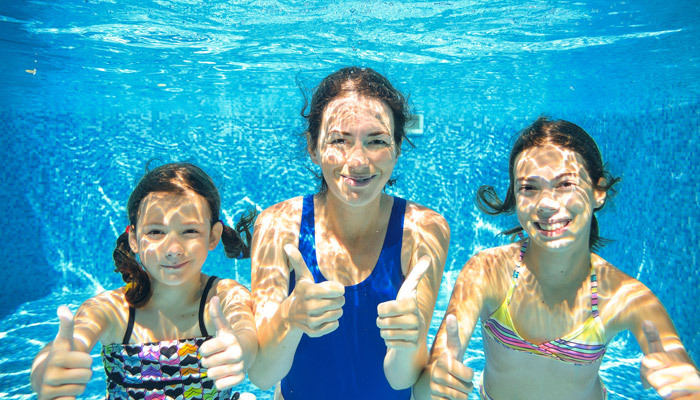 Now the next big step is to choose the kind of liner you want for your new swimming pool. In other posts, we’ve explored the pros and cons of Fiberglass liners and Vinyl liners. Now we’re going to explore the up and down sides of Concrete swimming pools. Like vinyl pools, concrete pools are unlimited when it comes to the shape, size, and depth. Typically, the type of concrete used for swimming pools is one that can be sprayed into a hole in order to create the pool’s shell. 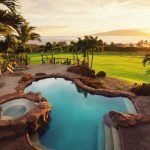 A concrete or gunite pool offers the greatest amount of flexibility when it comes to specialty features such as beach entries, tanning ledges, or vanishing edges. If you can envision it and draw it out, any design can be incorporated into your concrete pool’s design. 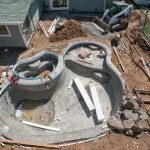 And kidney-type shapes are actually easier than rectangular ones, so you have an added excuse to get a little creative with your concrete pool’s shape. 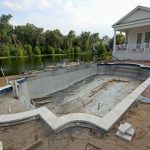 To add to the customization potential of a gunite pool, you can choose from many finish types: tile, plaster, or stone, in any color or design you like. The effect can be quite upscale and decorative! 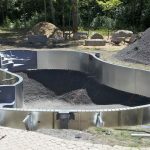 This kind of flexibility can allow your concrete pool to double as a work of art, easily blending in with the surrounding landscape, offering a truly unique pool. Due to the porous surface of concrete, more chemicals are necessary in order to prevent algae from growing. 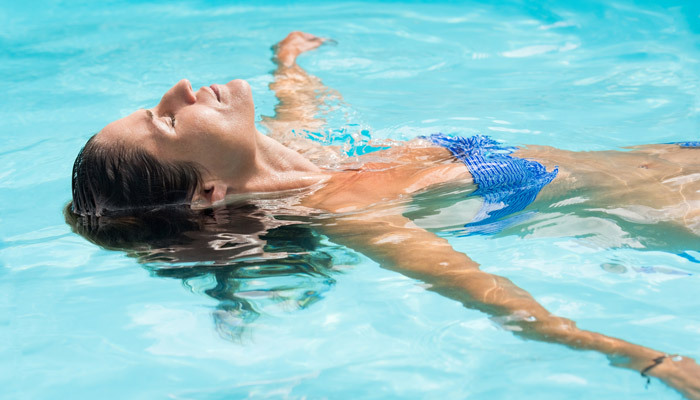 Added filtration requirements are also needed, due to the alkaline pH of the pool’s shell, which is constantly causing a higher pH of the water. Acid must be added to counteract that issue. 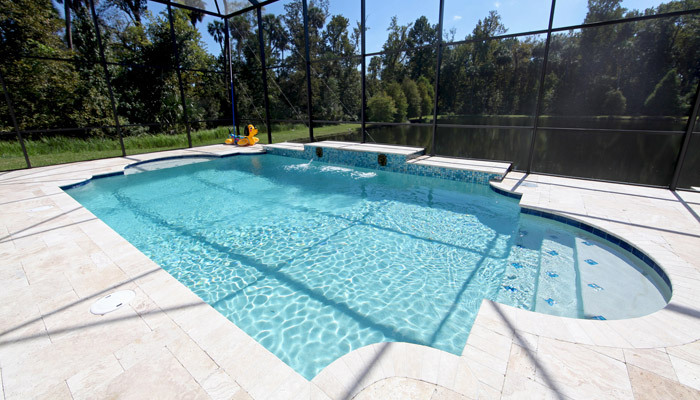 As an extension of that very issue, concrete pools tend to require more maintenance. They’ll need to be swept with a pool brush more often in order to remove algae. There is a longer install time. Perhaps the most significant downside of a concrete swimming pool is its high cost over its lifetime. The typical concrete pool requires renovation every decade or two. The necessary resurfacing and tiling can cost upwards of $10,000! The pros and cons listed above definitely don’t tell the whole story. A lot will depend on your setting. For instance, climate matters. Typically, gunite is more expensive than vinyl for those who live in colder climates. The reason is that when there’s risk of ice pressure causing cracking, extra steel wire is needed to reinforce the concrete. If you live in the south, however, this isn’t typically an issue.